If my dog Tenor were to be the judge, the Franklin dog park would rank #1, followed by the Brentwood/Bellevue/Nashville Warner Dog Park as #2. Actually, the Warner Dog Park is part of the Percy Warner Parks system which lies between Bellevue and Brentwood (and just a hop, skip, and a jump from Franklin), but it’s technically in Nashville. 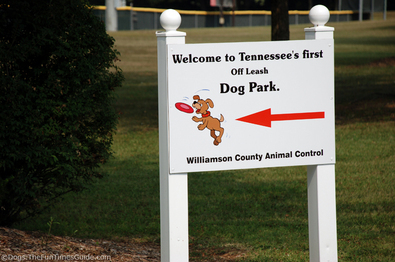 The Franklin dog park known as Maggie’s Bark Park has its own claim to fame: it is Tennessee’s first off-leash dog park! They’re both definitely worth a visit. 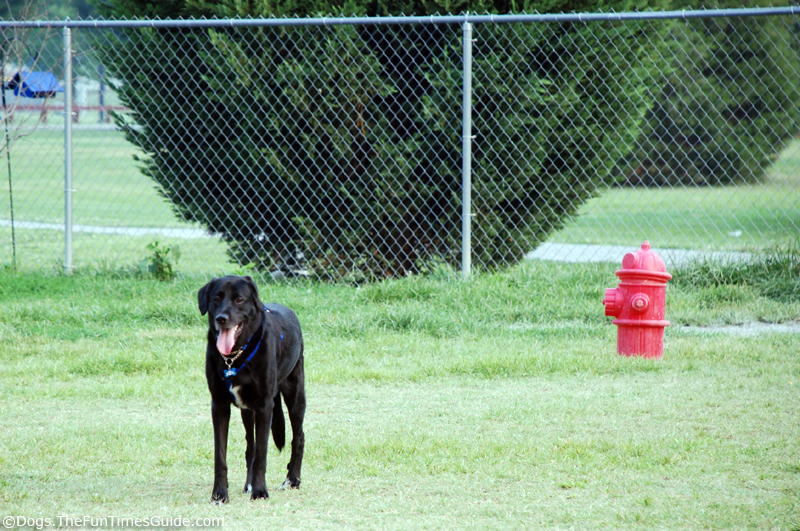 The Franklin Dog Park (also known as Maggie’s Bark Park) is located behind Franklin High School (and Columbia State University) — just off of Hillsboro Road and near Mack Hatcher Blvd. It’s also right next to Williamson Animal Control. (The barking as you walk from your car to the dog park is a sad but true reminder of all the dogs in need of homes). One thing that makes this dog park different from most: it’s loaded with dog-friendly obstacles — you know, those climbing, jumping, and crawling types of things that you typically find in dog agility classes. I like this dog park best because it has tons of balls of all sizes and rope toys and such for dogs to play with. They’re all stored in plastic crates on the fence — unless they’re left lying in the yard itself. I also like this park because there’s a water well and dog bowls. They’re located next to 2 kiddie swimming pools that are kept filled with water. Trust me, the dogs know they are allowed to cool-down in them. Dog park etiquette: If you are the first to arrive at the dog park (as in, there are no other dogs there at the time), it’s common courtesy to be the one to empty the dog water bowls and fill them with fresh water from the water pump. It’s hilarious to watch as most dogs (not mine… he’s a Lab, but he’s not crazy about water… long story.) will jump into the swimming pool after some serious sweaty playtime with their four-legged friends. Some will lie down in the pool. Others will splash around in the pool. And a couple of boxers I know will just standing there waiting for their owner to come splash water on them — as if they’re getting a bath! Another unique thing about this dog park… there’s a “small dog park” and a “big dog park”. They’re next to one another, but enclosed within separate chain link fences. This is especially great if you have a very tiny dog that might get stampeded by the larger dogs who tend to frequent dog parks. Or, if your big dog isn’t crazy about tiny four-legged friends. In case you’re wondering, the exact same dog agility obstacles, toys and play things exist in the little dog park as in the big dog park. That’s cool. For the humans… there are several benches to sit on while your dog is playing. Most of them are covered to shield you from the sun (or rain). The Franklin Dog Park is open 7 days a week — from dawn to dusk. Directions: Take Mack Hatcher Blvd. toward downtown Franklin. Mack Hatcher dead-ends at Hillsboro Road… turn left there. As soon as you see Franklin High School on the left, prepare to turn left before the school. Once you turn off Hillsboro Road, there are plenty of signs, leading you to the dog park. 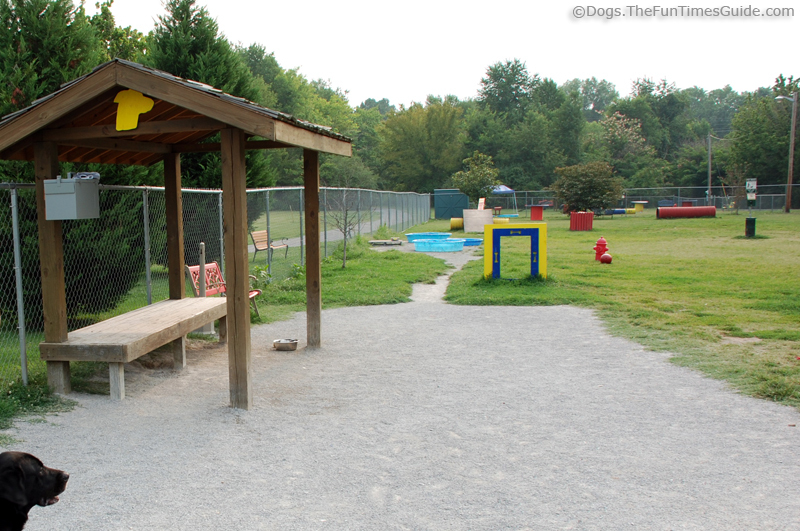 More about the Franklin dog park known as Maggie’s Bark Park. This dog park is part of the ever-popular Warner Park System… but it’s just off the beaten path. So you may not know it’s there, unless you look really hard. The Warner Dog Park is basically a big open field that happens to be contained within an enclosed fence. This may be viewed as a good thing… especially since relatively few dogs actually play with the toys and climb the obstacles that exist at the Franklin Dog Park (mentioned above). For dogs who prefer to romp and run with other dogs rather than play with toys and take advantage of dog agility ramps and jumps, this park is heaven on Earth. A few park benches line the fence on all sides — and a couple in the middle. However, there is very limited shade at this dog park. During the summer months, it’s difficult to score a bench in the shade. There are a couple of cool things for “the humans” who visit the Warner Dog Park — like this picnic pavilion and couple of drinking fountains. There are also bathrooms next door near the ball field (…porta-potties have been on-site all summer). The Warner Dog Park is open 7 days a week — from dawn to dusk. Directions: From Old Hickory Blvd. near Highway 100 in Brentwood (or Bellevue), turn onto Vaughn Road — there’s a traffic light at this intersection. Depending on which direction you’re coming from, turning one way on Vaughn goes toward Percy Warner Park, where the Iroquois Steeplechase takes place each year. The other way on Vaughn goes toward a baseball diamond. Just past the ball field is the Warner Dog Park (on the right). 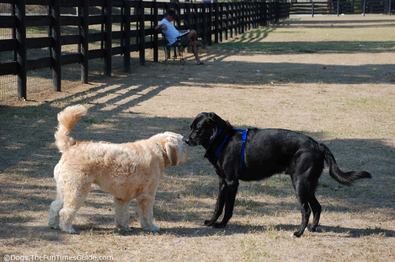 More about Warner Dog Park in Nashville.